As it happens, our back door is not just a back door. On top of its door-like qualities it’s also a) the quickest route to the car, which lives just next to the stairs leading out of our back door; b) and to the bins that live underneath the stairs, thus making taking out the rubbish a lot more straightforward operation that lugging it out the front door and the all the way around the building; c) it opens up to the only realistically usable outside space (unless you fancy sitting in the front garden while the people downstairs sit next to you on the other side of their lounge window), in a shape of a landing at the top of said stairs; and d) it also has a very important function as a cooking-aid, when the two (yes two) fire alarms inevitably go off while you’re trying to cook anything involving the hob. So, as you can imagine, when the lock on the back door broke in a way that prevented us from getting the door open, life became just that little bit more aggravating. Yesterday was finally the day when a man was coming to ‘fix the door’ (I use the inverted quotes quite purposefully here). I had to take a half day off as holiday, so I could be at home to welcome the saviour who was going to return our standard of living back to the level of only mildly annoying, as yesterday afternoon was apparently the only time it could be done and I certainly didn’t want to risk it never getting done. After hurrying back home at lunchtime I found a man in a suspiciously paint-spattered attire wandering outside the general vicinity of the building looking lost. I asked him whether he might have been there to fix our back door, and it turned out that indeed he was the right man, albeit he had been given a completely incomprehensible address by the company through which we rent our flat. Lucky that I caught him wandering around, otherwise he would have never found his way to the right door. I showed him in and he eagerly took to the task at hand, i.e. took my key and tried to get the door open. Nothing doing. Which I could have told him. It took about an hour of further swearing, violence and power tools until he finally got the door opened up. A great moment you’ll agree. What followed then were multiple phone calls to someone who was requested to purchase a new ‘strippy bit’ and a lock for the door. I must admit that my spirits started to waiver a bit at the mention of ‘strippy bit’. 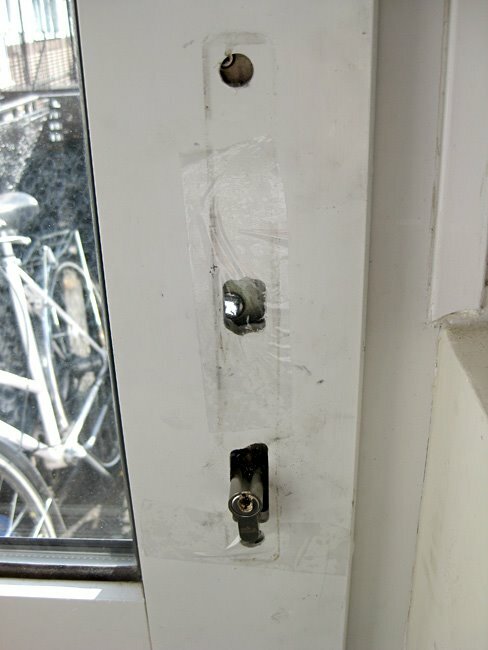 Surely an actual locksmith would know a slightly more technical term for the strippy bit? But perhaps that was just their chummy way of communicating, I concluded, probably after you spend most of your time installing strippy bits you start referring to them in affectionate terms. The next task was for him to get the whole mechanism (i.e. strippy bit) removed from the door so it could be replaced with a new shiny, and most of all, functioning one. Easier said than done. An hour of a lot more swearing ensued. Finally with the assistance of a power drill, the door was stripped down to a virginally strippy-bit-less state, the only thing that refused to move was the actual lock itself. Turned out this was the least of his problems though. While he’d been swearing and hacking into the door, the elusive partner at the other end of his phone calls had been on the hunt for the new mechanism. Funny thing (and I use the term ‘funny’ very loosely here) was, the manufacturer had apparently seized producing new strippy bits for this particular type of door. ‘Sorry love, you’re gonna have to get a new door’, were the words that once and for all brought my dreams, in the vain of summer nights on the balcony with a jug of Pimm’s, crashing down. At this point the door was looking a sorry state and, defeated, I was inquiring the man how we were supposed to live there (or more to the point, ever go out again) when we now had a door without any sort of way to lock it. ‘Don’t worry, I’ll screw it shut, it’ll be no big thing’. And so he did. With much further swearing and with screws that are bent completely out of shape, refusing to properly sink into the metal frame of the door. I don’t dare try how much pulling or pushing the door would take before the screws give in and anyone can just walk in. I also don’t dare to think how long it will take for us to get a new door, not that I have very high hopes of the door actually fitting the frame when it finally comes. All in all, not only did yesterday turn out to be a spectacular waste of precious annual leave hours, it also seems to have taken our predicament back a few steps instead of fixing any problems, as you can see from the picture. The sellotape is a touch added by me as it turned out that night time bugs were relishing the opportunity to fly in through the newly required airing holes. To sum up, I’m not best pleased. albeit mine about an oven. I swear that repairmen were put on this earth for the sole purpose of bleeding us dry and driving us crazy. Hope it works out with yon door. Still haven’t heard anything back about a new door… Hmm.